While going through your profiles, I noticed Walid’s and decided I would ask him questions. He liked the idea so we chatted a little bit. [HigherEdMe] You want to become an automation engineer, is that right? Why did you choose this field? [Walid] It’s a field I’ve discovered during my preparatory classes in Science and Technology (The School is called EPSTO and is located in Oran). Computer Science, optimization, mathematics and programming are my main strengths. Automation is a specialty that relies on a lot of those. Moreover, it is a specialty that opens up a lot of doors to jobs with a bright future. Robotics, artificial intelligence, and other affiliated areas have always been a dream for me. I’ve always done my best to have the best grades in the national competition to access the great schools. I was, by the way, received at the ENPC (National Polytechnic School of Constantine) where I started to see my dream come true. I’m currently a student in automatic engineering. It’s my fifth year and I’ll graduate in June 2017. [HigherEdMe] Congratulations! So you’ll soon have a Master’s Degree. Why do you want to pursue your studies? [Walid] I think I have a lot of knowledge thanks to my current studies. Nevertheless, I did not have enough practice. The ENPC is a school that only opened up its doors recently (2014) and unfortunately, it does not have enough equipment even if it’s important for our Master’s Degree. That is why I’d like to continue my studies in a School that will allow me to excel in my field. [HigherEdMe] Germany is a very interesting country,why did you choose this country to study? [Walid] Germany is « THE » country for automation and mechanics. I’ve also noticed, when I was an intern during my holidays in Algeria, that all the firms have equipment coming from German brands (such as Siemens). Thus I decided that I would not become the automation engineer who would wander in the firm to control or troubleshoot, but I would become the automation engineer who would help and contribute to the creation and to the implementation of the firm itself. To get these skills and this knowledge I really want, I’ll have to learn it in a country who excels at its job. It would also allow me to learn German. The fact that I can communicate in French, English, Arab (and perhaps in the future in German) would make me an engineer able to communicate and exchange ideas with almost everyone and who would be able to work anywhere in the world. [HigherEdMe] So you can speak three languages, that is amazing! What are the personality traits that would define you the best ? [Walid] I guess I can say that I’m the kind of person who does not talk about his qualities but who shows them with his actions. I like team working, I’m active, energetic and I have the personality of a leader. I’m extremely self-confident and I’m ready to accomplish major feats. [HigherEdMe] Why should a University choose you instead of someone else? 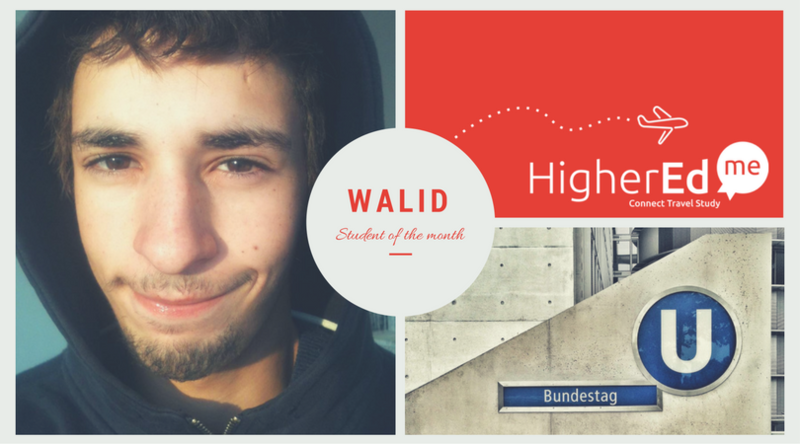 [Walid] I know what I’m capable of and I also know that if I’m lucky enough to be enrolled in a serious environment of innovation and dynamism, I’ll give everything I have and go beyond my limits. I’ve always done the best I could in order to fulfill my dreams and I’ll keep doing it. I would like to and I would excel in a great country composed of many elites. I won’t give up until I get there. [HigherEdMe] Do you have any hobbies ? If so, what are those ? [Walid] I’m a huge fan of programming and mobile development. I’m also the co-founder of a cultural and scientific club called « Cirtec » in which I plan events. I also love sports and practicing football. You too make a study abroad wish just like Walid and get the chance to be interviewed to be noticed by Schools. You want to be interviewed too? Feel free to contact me on Facebook.